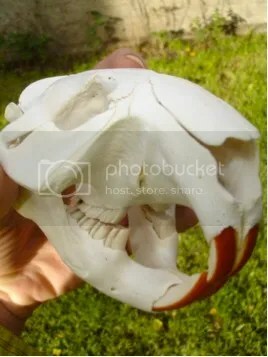 A beaver skull (read on for context). All photos by Amie Inman. Yesterday, I wrote a bit about a book I once read and how it related to the case of the introduction of the small Indian mongoose to Jamaica to try and control a rat problem. The situation of accidentally transporting a species onto an island (or a separate continent, which often amounts the same thing), realizing the mistake when the species causes problems with the local flora or fauna, and introducing a second species to try to control the first, only to have the second species cause its own more serious issues, is a fairly common one around the planet, although Australia seems to be particularly vulnerable (look up rabbits and toads). The case I wanted to write about today is an example of purposeful introduction of a species for human gain, but which was not properly researched beforehand and caused severe ecological damage that is still incompletely mitigated today. Today I’ll cover the beavers in southern Chile and Argentina. 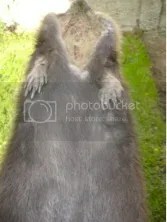 The story I had originally heard, several years ago when I wastraveling in Chilean Patagonia, was that a couple of American or European entrepreneurs had brought down a handful of beavers from North America and tried breeding them for the pelt trade in Tierra del Fuego. The beavers, due to the environmental differences between the southern and northern hemispheres, didn’t grow the same type of pelts as they did in the US and Canada, so in the unfortunate businessmen’s eyes the animals were useless. They let the beavers out of their enclosures and the population skyrocketed across the tip of South America, wreaking havoc in the ecosystem in ways I’ll describe later. In this year’s March issue of Scientific American magazine, science writer Katie Worth describes what I will take as the “true” series of events, given that the evidence was recorded on film in 1946. 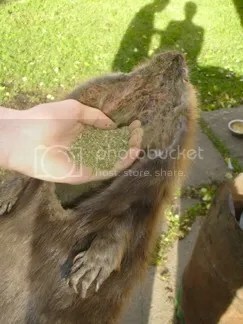 It turns out that the beaver introduction was in fact a government-sponsored program in Argentina, in which President Juan Perón’s administration intended to boost the economy with a previously nonexistent fur trade. I highly recommend reading the details in Worth’s short article linked above, but to sum it all up, twenty beavers were brought from Canada and today there are tens of thousands of beavers that have damaged half of Tierra del Fuego’s forests, worsened the watershed’s carbon cycle,* and radically altered the entire landscape with their dam-building environmental engineering. *The exchange of carbon between different elements of the ecosystem, like the atmosphere, water bodies, soil, and vegetation. After being skinned, the meat was taken off the bones and cooked. The skin was left to dry and the skull was boiled in water to clean it. Over a period of about two weeks, I would tenderize the skin and extract all its fat by beating it with a wooden club. But first, all gristle is scraped off with a spoon – then the skin is twisted to soften it, and wiped off with a rag so the oils will not rot it. 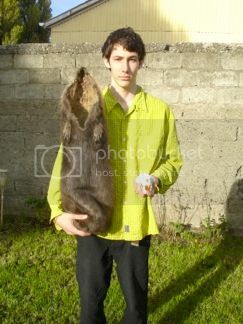 After extensive abuse to the beaver’s pelt, it lost its oiliness and dark color. The skull would have to be boiled in water and alcohol to be completely cleaned, and then glued together. The beaver’s skin was then cut several inches down the front, and patched wherever there were holes. A round piece of leather was sewn to the bottom so the bag would have cylindrical appearance. The bag was turned inside out, and treated with baby powder so as to not smell like a dead beaver. Half a kilogram of yerba maté was put into the bag to remove the last of the oils and left to dry, and then thrown out. The final product is then ready – simply fill with high-grade maté, and show off. Tomorrow: part three, on goats and blackberries in the Galápagos! glad you liked the post! I’d never heard about the earthworms being introduced, that’s amazing.